Amazon and Flipkart are celebrating their own shopping festivals named Great India Festival and The Big Billion Days respectively. Factually, you’re going to get some great shopping deals on smartphones, home appliances and much more. In this article, I’m sharing some of the best smartphones that will be sold with highest discounts during Amazon’s Great Indian Festival 2018 (10th to 15th October) and Flipkart’s The Big Billion Days (10th to 14th October). Amazon’s Great Indian Festival 2018 during 10th to 15th October is bringing up many flagship smartphones at huge discounts. This Motorola smartphone comes with many attractive features such as 4GB RAM, 2 GHz Octa-Core processor, 3000 mAh battery power, 64 GB internal memory etc. The original price of this smartphone is Rs. 16,999 but during the Amazon.in festival, you can get it at Rs. 9,999 only. Huawei P20 Lite can be a great smartphone for those who’re looking for an Android phone with 4GB RAM below Rs. 20,000. However, the original price of this phone is Rs. 22,999 but during Amazon’s shopping Festival, you can buy it in just Rs. 15,999. Samsung Galaxy A8+ is a flagship Android smartphone with superb features such as 6 inches display, 4GB RAM etc. The original price of this phone is Rs. 29,999 whereas due the sale it will be available at Rs. 23,990 only. If you’re fond of using Apple iPhone but your budget doesn’t allow you to buy the one, this is the great opportunity to buy iPhone 6 at just Rs. 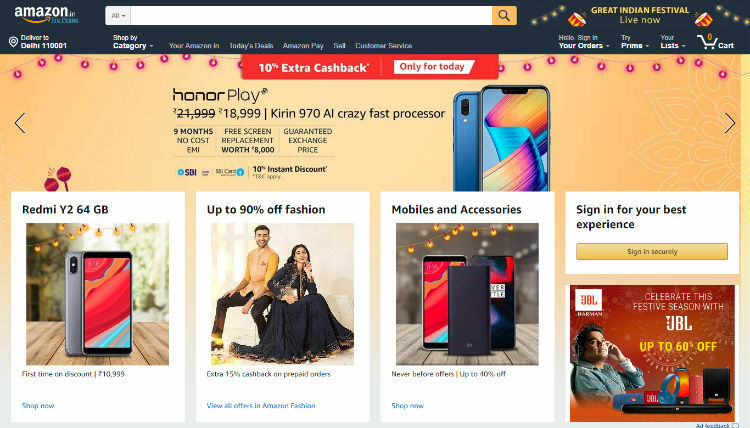 18,999 during Amazon’s Great Indian Festival sale. Not only these 4, but there are many great smartphones available with attractive discounts and offers. You should check out Amazon.in to know about more offers and discounts on different products during this festive sale. The Big Billion Days of Flipkart (10th to 14th October) every year come with exciting offers and discounts on various products. You’ve an unbelievable opportunity to get a flagship Android smartphone from the most trusted smartphone maker, Samsung at almost half of its original price. The original price of Samsung Galaxy S8 is Rs. 45,990, whereas during the Big Billion Days sale, you can get it in just Rs. 29,990 only. The USP of this Motorola’s smartphone is its RAM. It comes with 6 GB of RAM and many other great features that makes it a flagship smartphone. The good news is that you can buy Moto Z2 Force smartphone at flat 50% discount during The Big Billion Days sale. It’s one of the bestselling smartphone in India. The original price of this smartphone is Rs. 14,999 whereas during The Big Billion Days, you can get it in Rs. 12,999 only. So, these’re some of the best smartphones with attractive discounts during the shopping festivals of two popular shopping sites in India. You can visit Flipkart and Amazon during their sale period to avail such interesting offers.